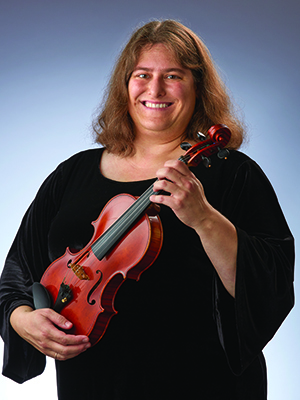 It was inevitable that Violinist Jennifer Greenlee, who joined the ISO in 1997, would become a musician, as she has many musicians in multiple generations on both sides of her family. Another influence was The Strings for Schools program in the suburb of Philadelphia where Jennifer grew up. Jennifer asked for violin lessons for her seventh birthday. Before joining the ISO, Jennifer played in the Delaware Symphony, the Opera Company of Philadelphia, and the North Carolina Symphony. She attended the Eastman School of Music where she studied with Charlie Castleman. Jennifer has also studied with Yumi Ninomiya Scott and Helen Kwalwasser. Jennifer performed as soloist with the Navy Band in Washington, D.C., where her father conducted. Her violin was made in 1959 by Giacomo & Leandro Bisiach in Milan. Outside of the ISO, Jennifer loves puzzles, reading, bicycling and sewing. Jennifer is married and has a teenaged daughter. Both her husband and daughter have a mitochondrial disorder, which is a form of muscular dystrophy. For more info on “mito” Jennifer encourages one to visit www.umdf.org. The 1997 European Tour was right at the beginning of Jennifer’s time in the ISO - a fond memory and also intense introduction to the orchestra. Jennifer loves anything written by Prokofiev, but also Beethoven, Brahms, and Bach. "I love the intense listening I can feel from the audience. The music grabs them and they forget about their outside lives. It's so incredibly satisfying to be able to create that communion with sound."